SAP users create Sale Quotations with products that contain multiple options. Multiple lines can be created each containing a configuration that is launched within SAP Business One. 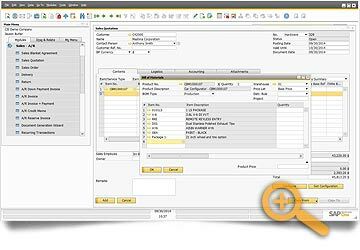 The Sales Quotation with the configuration can be copied to a Sales Order and then pushed to a Production Order with the accurate quantity of items. Production, Sales and Assembly BOM’s are supported. 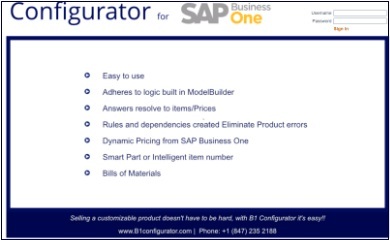 CIS Configurator is an intuitive tool that allows you to build your custom product logic into SAP Business One. Programming experience is not required and training is normally completed in hours. Graphics can be added to illustrate product features of the configuration built by the user. CIS Configurator is a web-based quoting application for organizations for Sales personnel, resellers, dealers and customers. External users create Sales Quotations containing configured items are created and stored in a centralized location. 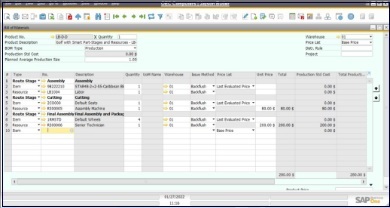 CIS Configurator uses the SAP Business One price lists ensuring accurate pricing. Quotes are converted to Sales Orders in SAP Business One. One of the many additions now allows you to assign the Routing and Stages setup in SAP to CIS Configurator. Make selling easier. Schedule a demo today.